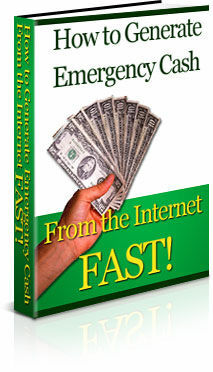 TripleClicks.com: How To Generate Emergency Cash From The Internet Fast! The report that's saved homes, marriages, and sanity... " What Do You Do When Your Back Is Against The Wall - And You Need Emergency Cash NOW? ... Here's The Solution Offered by Legendary 12-Year Internet Marketing Mentor Willie Crawford To His Students" It's no sin needing money. We all find ourselves in that predicament from time to time, and it's often due to circumstance completely beyond our control. Perhaps you got laid off due to "down-sizing" Perhaps an unexpected medical emergency came up Perhaps the car needed emergency repairs Perhaps snow building up on the roof caused major damage that had to be repaired immediately just to keep the elements from ruining everything in the house. The Good News Is You Can Pull Out! There Are MILLIONS Of People Online Every DAY Looking For Solutions To Their Problems. When You Solve Those Problems, They Happily Pay You! That's what this report teaches you how to do, and it teaches you to do in "in a hurry!" Leveraging the numerous 100% free, and very inexpensive tools and resources pointed out to you, YOU CAN earn quick cash on the internet. There IS a little work involved... but you're too smart to believe that you can get rich doing nothing anyway.
" What Do You Do When Your Back Is Against The Wall - And You Need Emergency Cash NOW? ... Here's The Solution Offered by Legendary 12-Year Internet Marketing Mentor Willie Crawford To His Students"
There Are MILLIONS Of People Online Every DAY Looking For Solutions To Their Problems. When You Solve Those Problems, They Happily Pay You! That's what this report teaches you how to do, and it teaches you to do in "in a hurry!" Leveraging the numerous 100% free, and very inexpensive tools and resources pointed out to you, YOU CAN earn quick cash on the internet. There IS a little work involved... but you're too smart to believe that you can get rich doing nothing anyway.